It’s been said that the works Matisse produced during his time spent in Nice were the most joyous and prolific of his career. He had initially left Paris to treat his bronchitis and fell so much in love with Nice that he permanently moved to the city in 1921. The painter took an apartment in the big yellow building at the top of Cours Saleya and spent his days gathering inspiration from the subtleties of the charming French town. You can visit the Musee Matisse in Nice, and view the world’s largest collections of his works. In 1917, Matisse relocated to Cimiez, on the French Riviera. During his last years in Paris, his paintings had been blue and dark. They exhibited a loneliness common to artists of the time such as Picasso. It wasn’t until he moved to Cimiez that his works began to show a relaxation and softening to his approach. Some contemporary critics found these works shallow and decorative, but Matisse was the happiest he had ever been, regardless. When you visit the Musee Matisse, you’ll stand at the foot of a 2000-year-old olive grove with the ruins of a Roman Amphitheatre to your left. A small Friar’s museum is located nearby, with a room dedicated to the Shroud of Turin ( the burial cloth that may or may not show the imprint of Christ’s body). Just a short distance from the Matisse Museum lies the beautiful Regina hotel. It was here that Matisse became too crippled to paint, and dedicated the rest of his days to created collages that he called “painting with scissors”. Stroll through the Old Town and grab a bite to eat at one of Matisse’s favorite restaurants, Niçois at l’Acchiardo. 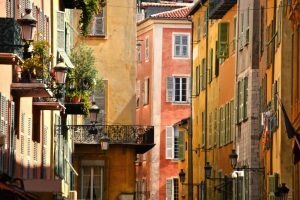 Dine traditionally, or head across to the street to the nearby Bar-du-Coin for the best pizza in Nice. This entry was posted on Wednesday, April 5th, 2017	at 2:39 pm	. You can follow any responses to this entry through the RSS 2.0	feed. Both comments and pings are currently closed.